Driving directions have been added to the Google Maps API v3. For version three of the API directions have been split into two, DirectionsService which passes directions queries and DirectionsRenderer which displays the results on the map. Google have provided an explanation of the concepts involved, examples and a reference guide. 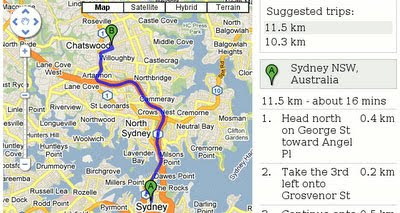 Mapperz has also created a couple of examples; Directions and Directions with a Directions Panel. Know Where You Live was the runner-up in yesterday's Australian GovHack. 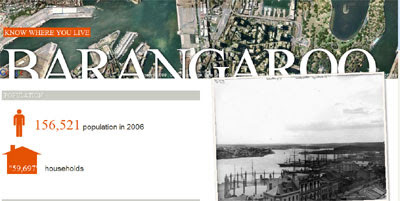 The site provides a wealth of local information about Australian neighbourhoods. To use the site users simply have to enter their postcode (try '2000') and Know Where You Live returns demographic information, income levels, rental returns and crime statistics for the area. What I like most about this site, however, is the use of a Google Map as a header to the page, with the name of the district superimposed on top. 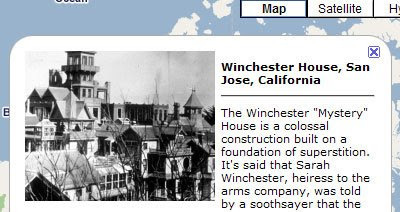 Our friends over at Google Sightseeing have put together a nice collection of the world's most haunted places. Today saw the start of the 2010 Olympic Games Torch Relay in Canada. The torch started its 45,000 km journey this morning in Victoria. It will arrive in Vancouver for the start of the Olympics on February 12th. Using this official Google Maps mash-up it is possible to find out where and when you can go to watch the torch on its route. The Vancouver 2010 Olympic Organizing Committee is using the Flash Maps API to show the Olympic Torch route. 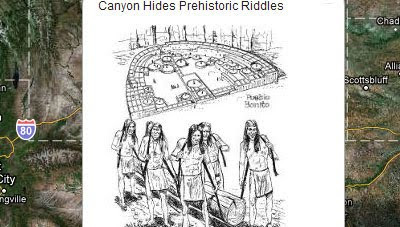 It is possible to search the route by a particular day, by a province, territory or by community. Each day of the torch's route through Canada has its own map marker. Clicking on a map marker opens an information window with links to information about each of the celebration communities. Busted Tees have produced this T-Shirt design, which is available at $16.99. A Google Map highlighting some of the locations from the book Strange But True. The book looks at some of the weird stories in America's history. Southern Destinations have produced a number of Google Maps to highlight some of the stunning tourism opportunities available in southern Africa. The site includes a number of Google Maps for South Africa, Botswana, Namibia, Mozambique and Zambia. Each of the destinations includes a number of categories to choose from when exploring the area. For example, the Cape Town map includes golf courses, activities, wine regions, adventure activities and whale watching opportunities. Each category includes a number of map markers that, when clicked, open information windows that display photographs and videos of the chosen location. This Google Maps based art project was designed for the Ingràvid festival in Figueres, Catalunya, Spain. The map was created by the same team that created the Danish Google Map art project, Social Souvenir. The project involved the 'Urban Cursor' a GPS enabled object designed to facilitate social interaction and play in public space. The object, a 3 dimensional oversized computer cursor (pointer), was placed in a square in Figueres. Here, people could touch it, move it around and sit on it as an alternative to the benches. Via an embedded GPS device, the cursor transmitted its geographic coordinates to a website. At the website, the coordinates were mapped in Google Maps thereby documenting the cursor's movements in the physical world and making it possible for participants to see how they collectively helped moved the object around. During the festival participants could also upload photos of the cursor at the website. The photos were automatically placed on the map by matching the photo's digital time stamp with the GPS coordinates. Cartifact, Inc. and Greening Point, Inc. have launched a new interactive map showing how various climate change scenarios could affect the USA through sea levels rises. The initial release provides maps for the San Francisco Bay area and a detailed focus map of the Santa Cruz to Salinas portion of the Monterey Bay. The map uses Cartifact's excellent scope-like lens to highlight aerial imagery of the roads and buildings that, depending on local topography, could potentially be inundated by rising global ocean levels, waves, storm surge and flooding. Both companies say that they are not making a prediction that sea levels will rise to a specific level but "want people to learn about possible climate change scenarios, the science behind them, and the potential outcome of each." In the most extreme scenario on the map the Google Offices in Mountain View look likely to end up under water. I wonder if Google are planning to update their kayaking directions. Google have just announced Google Maps Navigation (Beta) for Android 2.0 devices. This is a major new development from Google. The new feature comes with everything you'd expect to find in a GPS navigation system, like 3D views, turn-by-turn voice guidance and automatic rerouting. Google Maps Navigation is currently only available in America. I assume this is related to Google Maps' recent imagery update in America, when Tele Atlas' map tiles were dropped in favour of data from Census, land surveying, specialized data sources like the USDA Forest Service's Forest Boundaries and the US Geological Survey's National Hydrography Dataset. Hat-tip to Street View Gallery for the head-up on this. Whilst Google Maps has been available in South Africa before, it now has now been enhanced with driving directions and a webcams layer. 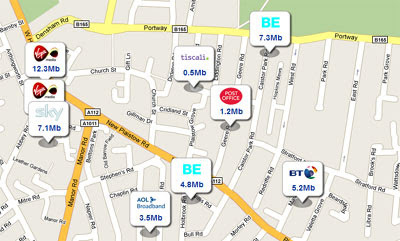 Businesses can now also add themselves to the map for free at Google's Local Business Centre, http://www.google.com/lbc. The Street View cars are also busy in South Africa capturing imagery for the launch of Street View in South Africa, probably sometime before next year's World Cup. The areas of South Africa covered include Cape Town, a number of national parks and Robben Island. The site also has a dedicated Google Map for World Heritage sites in South Africa. Izimvo have used the Google MyMaps feature to create a map that they have embedded on their website. The map shows the locations of recent South Africans that they have interviewed. Clicking on a map marker reveals a thumbnail portrait of the interviewee and a link ot the interview. The details of each property comes with a Google Map to display the property's location. 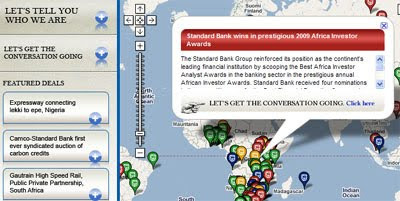 Standard Bank is a leading African banking group that focuses on emerging markets. The bank is using Google Maps to highlight the organisation's operations and publicise it's deals around the world. The map's markers are colour coded by 'operations, 'deals', 'accolades' and 'news'. The category of map marker currently shown on the map can be further refined by using the drop down menus at the top of the map. Featured deals are also shown in the map sidebar. Clicking on any of the sidebar links will centre the map on that featured deal and open an information window with further information. Tour operator Expert Africa have a large number of Google Maps mashups for the countries, areas, safari camps and lodges in Africa that they send their customers to. The African Tourism Portal is an interactive African tourist guide which features rich media content including videos, photographs and tourism podcasts. The site currently covers countries in the southern half of the continent. The African Tourism Portal allows the user to select categories of map marker to view for each country in the guide. It is possible to select categories of map marker from 'attractions', 'restaurants' and 'accommodation'. Within each of these categories it is then possible to select from a number of subcategories. Clicking on any of the star shaped 'destination' map markers opens an information window which contains rich media content about that location. The rich media content includes podcast descriptions of the destination's attractions and/or tourist guide videos and photographs of the location from Flickr. This Google Map mashup contains an amazing amount of data about the African continent. AfricaMap has been developed by the Center for Geographic Analysis at Harvard University to make spatial data on Africa easier for researchers to discover and explore. The incredible amount of data on this map is organised into three main categories: View, Map Layers and Places. The three categories can be accessed via tabs at the top of the map. The View tab is the one to select to view the map and to select from the different map types. The Map Layers tab is the main tab for selecting what data you wish to see presented on the map. The data is then sub-categorised into Base Mapping, Economic, Environmental, Ethno Linguistic, Ethno Classification, Harvard Collections, Historic Maps 1800 to 1950, Historic Maps 1800 to 1950, Local Projects, Period Maps, Place Names & Political and Population. The Places tab allows users to access Place Name information across the continent by category. 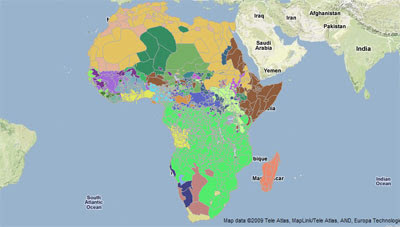 The database contains hundreds of Place Types for Africa (i.e. administrative divisions, populated places, farms, streams, etc.). This Google Maps mashup is for those with dietary restrictions, such as celiac disease, autism and food allergies. The site shows the locations of restaurants, shops and hotels with gluten free, dairy-free and food allergen free options. 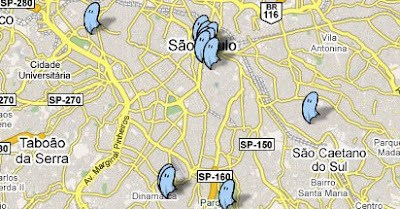 The map currently holds over 15,000 restaurants and shops all over the world and the site is available in three languages (English, Portuguese and Spanish). 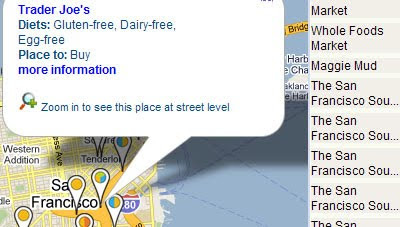 It is possible to search the mapped retailers by dietary requirement (Gluten-free, Dairy-free, Peanut, Nut-free, Shellfish free, Egg-free and Soy-free). It is also possible to search the map by type of establishment (restaurant, shop or hotel). Soren Johannessen was inspired by my animated map of explorer/ecologist J. Michael Fay's close-up imagery of Africa and decided to create a Google Earth browser plug-in tour using the same imagery. The tour features music by Idealist and also comes with a link to the kmz file, so it is also possible to watch the tour directly in Google Earth. Geocaching is a treasure hunt game in which the participants use a GPS receiver to hide and seek containers (called "geocaches" or "caches"). The largest geocaching website is Geocaching.com with hundreds of thousands of caches. The website includes about 904,000 caches in over 200 countries around the world. Geocaching uses Google Maps to show geocaches that can be found around any location. 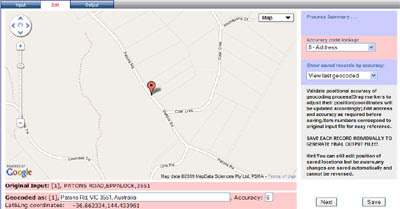 GeoJournal is the first application of it's kind written for the Mac to manage your Geocaching adventures. It's got a ton of great features that allow you to plan, manage, and record all of your geocaching adventures. Drop.io is a file sharing / storing site that allows users to store and share pictures, videos, audio, documents etc. without having to register or give an e-mail address. Drop.io utilises Google Maps so that users can add a location to an uploaded file. Adding a location to a virtual file can help users create a geocaching event. A Wired article explaining how to take part in a geocaching event using Google Maps without a GPS unit. 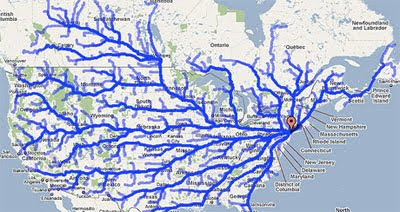 This Google Maps mashup holds a lot of information about almost everywhere in the world. The site aggregates information from a number of sources to give you the background on local places, upcoming events and travel guides for any location in the world. Using the map it is possible to find out about the local night-life and entertainment venues of a location. These points of interest are listed under 'Places' in the bottom menu. 'Places' are categorised into bars, clubs, restaurants, shopping and movies (powered by Trusted Places). 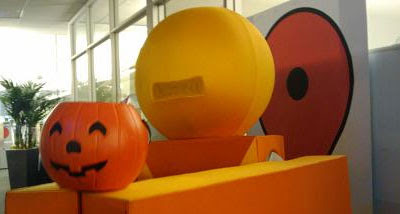 Upcoming events are categorised into arts, concerts, culture, festivals, night-life and sports (from Eventful, Lastfm). Using the travel section it is possible to book flights, hotels, hostels and get travel guides (from WikiTravel). And, if all that wasn't enough, the map also displays the local weather. The Discovery Channel's Storm Chasers series is back with series two of the popular tornado chasing television show. To accompany the series the Discovery Channel have relaunched their excellent Google Maps mashup in association with iMap Weather. 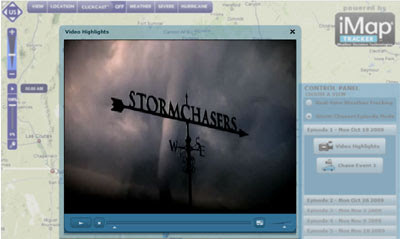 The map displays video, weather and vehicle position highlights of the Storm Chasers vehicles corresponding to the eight new episodes in the series. The map also features up-to-date weather information from iMap Weather. It is possible to use the map to follow the live position of the Storm Chaser vehicles and to watch live video streams of the tracked storms. If none of the vehicles are live it is possible to watch highlights of the episodes that have already aired directly on the map. 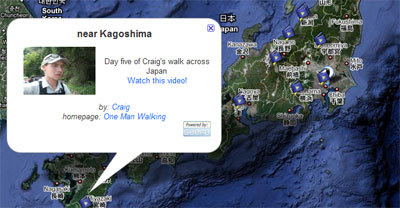 Last year Craig Stanton walked across Japan. He created a Google Maps mashup of the experience to help show his progress and to act as a record of the event. The map plots his route from Cape Sata to Cape Soya. Besides Craig's route the map also contains photographs and videos from the trip and blog entries. It is also possible to turn on other layers showing the 88 temples of Shikoku and other interesting locations. 30min.jp is a Japanese city guide that displays information about restaurants, shops and other interesting locations. The site displays information about each location based on entries scraped from relevant blogs (currently from around 8,000 blogs). The site displays points of information based on time, showing only those locations that are within 30 minutes of your current location. For each place recommended, 30min.jp shows its location on a Google Map. LogEarth maps users' tracks and trails. Users can use a GPS unit or an iPhone to track their trails and can then use LogEarth to display their movements on a Google Map. Each map created on LogEarth includes an embed option. It is therefore possible to upload a trail on LogEarth and display the created map in your own website or blog. It is possible to search the site for tracks and trails already created and the site also prominently displays the most popular trails and the most recently uploaded. In the UK the government have established a website called 'Directgov / innovate' to provide an "innovative, collaborative, open source environment for Government and developers to interact, share ideas and showcase work". Part of this initiative is the 'Safer Streets' site. The 'Safer Streets' campaign consists of three Google Maps which residents can use to report to local councils and police teams where they feel safe or unsafe in their neighbourhoods. The three pilot maps are for the towns of Brighton, Luton and Solihull. 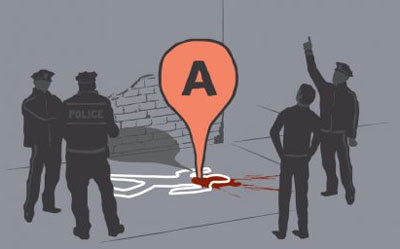 Users of the maps can place markers on the map to show the areas they feel safe or unsafe. 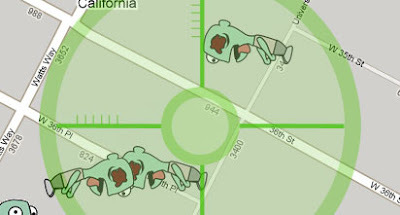 The green markers show safe locations and the red markers unsafe locations. Green ticks appear when local agencies post a response. Yellow markers can be used to post suggestions on how a particular street or location could be made safer or to provide safety tips or information to other residents. 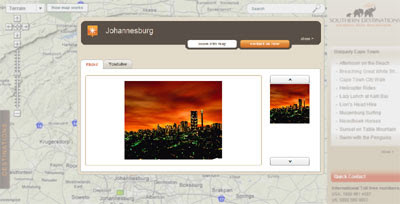 Users can also add comments or upload photos to the maps. October 31st sees the end of analogue television in Denmark. From November 1st all television in Denmark will be digital. A recent survey however showed that 120,000 households have not yet bought a digital receiver or a new digital television. 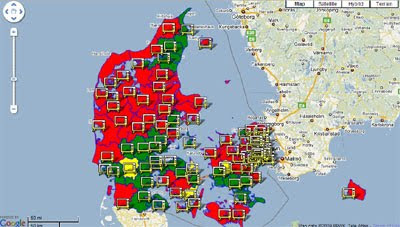 Forside Digital TV - a Google Map showing the coverage of the new digital signal in Denmark. One of the hidden treasures of Google Maps is Mike Fay's Megaflyover images of Africa. These images provide some super close-ups of a number of African animals. This Safari map animates through a few of the best images from the Megaflyover. Unfortunately this map tries to default back to Google Maps' normal zoom levels. The secret in using this map is to press the 'Play again' button (bottom right) which forces the map to zoom in beyond the default levels and exposes some great close up shots of the animals. The Tap Map is an Irish website that utilises the power of the Twitter and Google Maps API's to visually display where people are drinking in Belfast. All a user needs to do is Tweet their drinking location from a bar in the city using their regular Twitter account and they will see themselves appear on an overall map of Belfast. The Tap Map currently updates every hour (whilst in Beta). 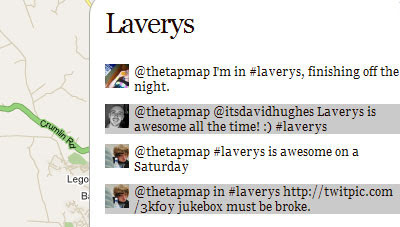 To add yourself to the map just Tweet @thetapmap and tag the name of the bar, for example #stiffkitten. Using the data provided by users The Tap Map is then able to provide a list of the current hottest places to drink in Belfast. 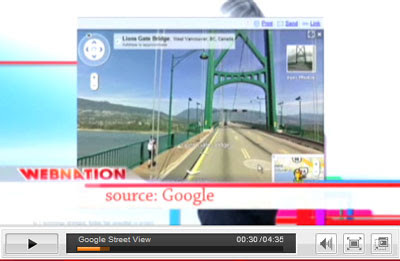 Google Maps Mania founder (and now Google employee) Mike Pegg appeared this week on Webnation to talk to Amber Mac about Google Maps Street View. "include numerous refinements to color, density, typography, and road styling worldwide. For example, in map view, local and arterial roads have been narrowed at medium zooms to improve legibility, and the overall colours have been optimized to be easier on the eye and conflict less with other things". In this view you can see that more roads are clearly visible in the updated design. In this new view place names are clearly more visible. I also think that at the higher zoom levels far more interactive business icons are being displayed. Google doesn't mention this in their announcement, so I can't be sure of this. 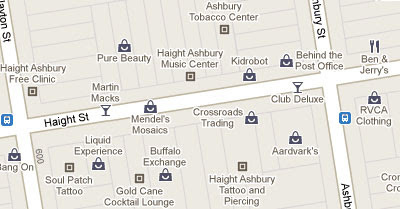 However check out Haight St, San Francisco below, this number of points of interest looks new to me. Anyway TechCrunch are fans of the new design. They say that "it’s clear to see that the new look is much nice (sic). Gone is much of the clutter cause (sic) by darkened street outlines." Top 10 Broadband is a free to use broadband speed tester for the UK. The site can test your broadband speed and can then show you how your broadband speed compares with the speed of your neighbours' broadband. There are many factors that can affect your broadband speed. Your geographical proximity to an exchange can effect the speed of your internet connection. Therefore it is very useful to be able to compare the speed of your service with the speed of your neighbours' connections, especially when they are using different service providers. Having tested my broadband connection I'm pleased to find that I have chosen the service provider with the fastest speeds in my neighbourhood. However I'm slightly disappointed to find that my connection is significantly slower than others using the same provider - doh! Google Maps Mania's new Australian contributor Arek of All Things Spatial has just released an address geocoder that uses the Google Maps API to find the latitude and longitude of addresses. To use the geocoder you just need to enter a list of addresses and press 'start'. You can then review, edit and save each address individually before outputting the geocoded results as a csv, kml or GeoRSS file. I currently use the Batch Geocode website to geocode addresses but I like the choice of output in the Address Validation Tool. I think it might just become my preferred geocoding tool. 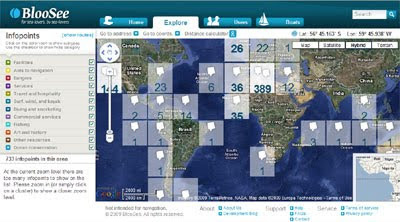 BlooSee is a social network for sailors and sea-lovers, a website where sailors can share their knowledge about the oceans of the world on a Google Map. Using the map it is possible to find and add marine related information such as facilities, aids to navigation, commercial services, surf/kayak/windsurf spots, art and marine history, ocean conservation data, etc. The information is organised into categories and the layers of category are colour-coded. It is possible to select any combination of category to view on the map using the menu in the map side-bar. Sailors can also use BlooSee to chat with other sailors and share their photos and experiences. Flickr user Scloopy has created a rather beautiful photoset 'Everywhere to Here' of Google Maps screenshots, showing traffic directions to a particular direction from just about everywhere else. Also check out his cool Chrome Canopy Experiment. 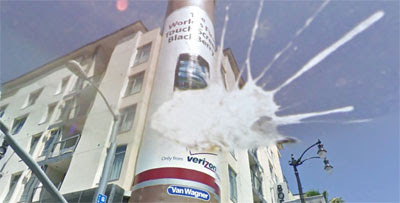 I'm sure no criticism is implied in this Street View of a BlackBerry ad. 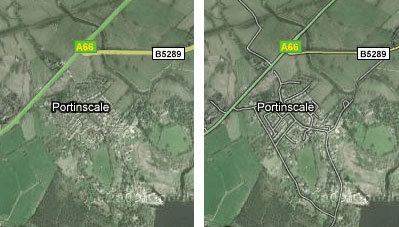 In the UK, Google's map coverage is so good it has even mapped towns that the locals didn't know were there. 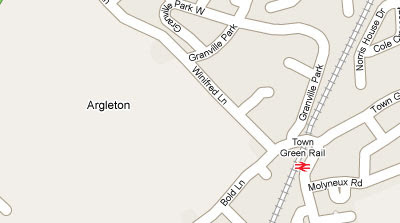 The town Argleton is clearly shown on Google Maps in the north west of England, even though no such town exists. The fact that the town doesn't actually exist didn't stop the Walking Home to 50 blog packing up a picnic and setting off for a day-trip. 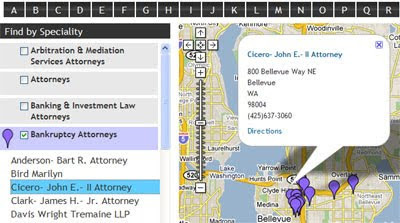 This Google Maps mashup can help you find an attorney in Bellevue, Seattle. The map has a database of around 500 lawyers categorised by speciality. The different categories are listed in the map sidebar. It is possible to select any combination of specialities by clicking on the check-boxes in the sidebar. Each category has its own colour of map marker so it is easy to differentiate the lawyers displayed on the map by speciality. Clicking on a lawyer's map marker opens an information window that contains the name and address and a link to the lawyer's record in the database. It is also possible to search via lawyer name by using the letters displayed at the top of the map. This Google Maps mashup serves as a grave locator for Krakow in Poland. The map lets you search for the grave of any individual and will take you to the deceased's specific grave plot. 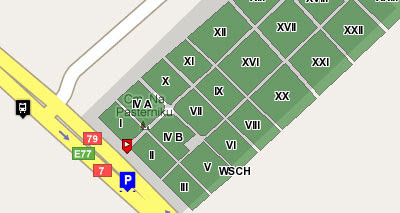 The map includes overlays for all of Krakow's cemeteries that shows the individual grave plots within each cemetery. 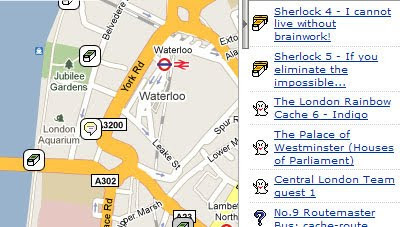 The search box to the left of the map allows the user to search for a specific person's grave. Users are able to define a date range to help narrow the search for popular Polish names. The map also includes bus-stops for each of the cemeteries, with bus times, and shows the locations of all cemetery entrances. Version 3.2 of Google Maps for mobile is now available for BlackBerry. The update includes the ability to view layers (for example Wikipedia) and your saved MyMaps. 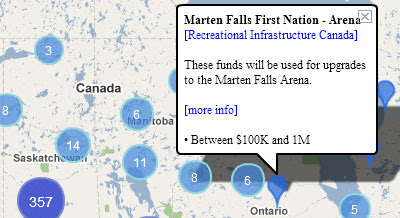 The GoogleMapsDev team have used the Google Maps for Flash API to map over 7,000 projects funded by the Canadian Government as part of its $61 billion dollar economic stimulus package. The map has filters, positioned at its right edge, that let you control which projects appear on the map. You can also click "Go Full Screen" to make the map bigger, or "Export CSV" to export the markers in view to an Excel spreadsheet. The versatility of the Flash platform allows large sets of markers to be grouped into "clusters" and sized and coloured to reflect the number of markers contained within. Together the filters and the cluster-based visualization provide a simple analytic tool that let you explore "what-if" scenarios. Also, each fixed-sized marker cluster provides no visual clue as to how many markers it represents. For example, it is much easier to see on the GoogleMapsDev map than on the government map, that almost half of the projects have been allocated to Southern Ontario, a small region (geographically speaking) relative to the size of the country. Regular readers of Google Maps Mania will be aware of my dedicated tracking of UFO sightings in Street View. 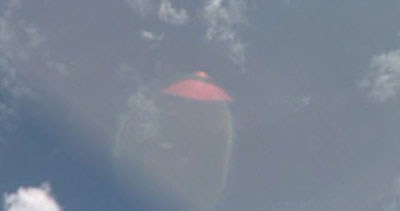 Some sceptics have suggested that the UFOs are actually lens flares, so I am glad to say I now have incontrovertible proof. If that doesn't convince you then check out the screenshot below which clearly shows (through the craft's translucent walls) some alien text on the side of the UFO. In the image you can clearly make out the word 'visit'. I suspect that this is part of some alien tourism advertising campaign. From the little text that we can actually see I have been able to reconstruct the message in full, It reads, "Visit the Great Orion this Summer". Still not convinced? Then check out these UFO sightings in Street View. In Europa is a Dutch television series that looks at the history of Europe in the Twentieth Century. To complement the series a Google Map has been produced that looks at some of the defining events that shaped the continent in the last century. Above the map is a timeline that enables the user to navigate through the years. The years that have content are shown in red. When you click on a year the relevant map markers for that date are shown on the map. As well as text, the map includes pictures and video clips from the television series. The map is in Dutch only. ReMap is a playful attempt to explore and appropriate Google Maps by replacing satellite imagery with photographs of similar shapes. 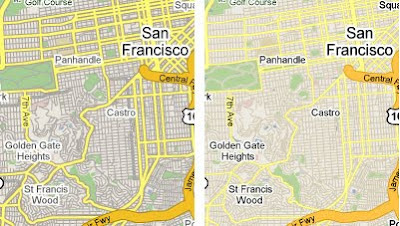 The idea is to create a Google Map in which the satellite imagery has been substituted for photographs, taken by remappers, that look similar to the original map tiles. Kayak.com have created a Google Map mashup that will do a live search for cheap flights from any airport in the world. To initiate the map the user just has to type the name of an airport in the search box and press 'change home airport'. The map then shows live searches for cheap fares to other airports around the world. Each flight path and airport is then added individually to the map. Clicking on any of the map markers will open an information window with details of the fares and a link to the relevant page on Kayak.com. The fares are also displayed underneath the map. Our favourite Canadian newspaper, the Toronto Star, features a regular Map of the Week column on its website. This week's map shows the average annual drug charges per 1,000 residents in Toronto from 2004-2008. The Star have produced a heat map using shaded polygons to give the reader a quick overview of the frequency of drug charges in different neighbourhoods. The Star says that the map shows a "familiar check-mark shape extending diagonally down though the west end, through the downtown and up again through Scarborough". This same pattern has emerged on The Star's Homicide Map and the home addresses of Toronto's Provincial Inmates Map. However, as The Star points out, the map doesn't reveal if the charges relate to residents of these areas or to people from outside who are visiting the area to buy drugs. Showstreet is a New Zealand Google Maps mashup that allows users to navigate a street level photographic view of shops and businesses in Auckland and to get details about individual stores by clicking on interactive links. Navigating Showstreet is pretty intuitive. 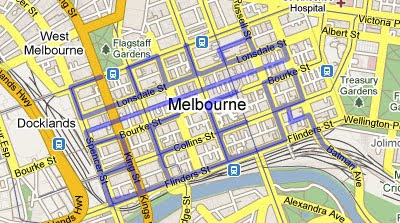 Streets that have Showstreet coverage are shown on the map in blue. Click on a blue line to load the street view imagery. You can then drag the image, use the arrows at the side of the image or drag the female shopper icon to move along the street. 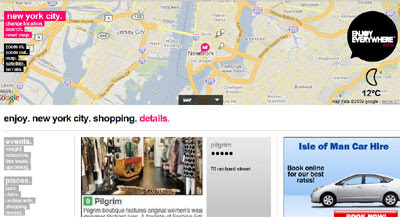 Businesses can sign up with Showstreet and have interior panoramic images of their stores appear on the map. Registered businesses can even log in and edit business details and post specials and updates. Standing in the rain waiting for a bus is a pretty depressing experience. In this day and age there aren't many excuses for transport companies not to provide customers with real-time information about arrivals and departures. 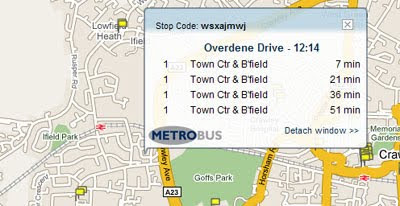 Congratulations then to UK bus company Metrobus, who have released a number of Google Maps showing real-time bus information for all of their routes in West Sussex. The maps show each stop on the route. Clicking on an individual bus-stop opens an information window displaying how long until the next two or three buses arrive. Even better, this real-time information is also available by mobile phone. To access the mobile service go to metrobuswap.co.uk. BMW has created a website where users can create their own geoglyphs. Or, to put it another way, you can draw interestingly shaped patterns on Google Maps. Of course being a car company there is a driving scenario attached to the project. Namely, once you have created your drawing, you can then download the route into your GPS device and drive your very own drawing. As well as creating routes of your own you can browse the drawings of others. You can search for previously created routes by 'top rated', latest drawings' or you can browse for routes geographically from a Google Map. Convert Any Image Into an Interactive Map!